The Bear Gulch Limestone is an amazing fossil bed that dates to the Mississippian epoch of the Carboniferous Period. Some of the most notable specimens are of fish. The Bear Gulch fish are extremely diverse. They include sharks, rhizodonts, petalodonts, and even a lamprey. The Bear Gulch is a fresh and brackish water deposit, suggesting that the environment was similar to the Mazon Creek and was an estuary or a lagoon connected to the sea. Since some of the fossils show signs of stress during death, and rarely show signs of decay and scavenging, scientists believe that they were buried rapidly, similar to how the Burgess Shale fauna were buried. 11-27-2011, page referenced last updated 02-01-2006. Invertebrates in the Bear Gulch limestone are diverse, but not as diverse as fish, which are one of the most varied groups of organisms found in the Carboniferous Bear Gulch Limestone. This is similar to the Devonian Period, when fish were extremely diverse. 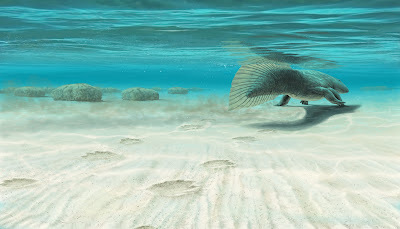 But Bear Gulch fish probably weren't as diverse as Devonian fish, because many kinds of fish went extinct at the end of the Devonian, including placoderms, armored jawless fish, the so-called "fishapod" forms, and thelodonts. Skeemella made from foil off chocolate coins. We're planning a trip to the Field Museum in Chicago to celebrate Art's eighth birthday. He's never seen the Field Museum, and their exhibit "Evolving Planet" looks excellent. We've added a ChipIn widget to the blog to help pay for the trip. Art will definitely blog about the experience, and I'll take a ton of pictures. Thanks to everyone who reads the blog and supports Art's work. He lives for this stuff! I've written about this animal before, but there is more information that I would like to talk about. 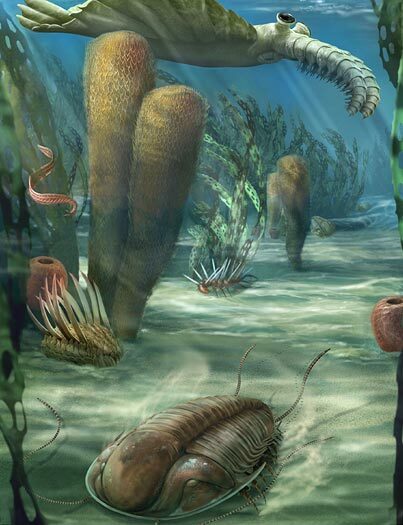 Anomalocaris was a very widely distributed Cambrian animal. Their remains have been found in at least China, Australia, Nevada, Pennsylvania, California, Georgia, Utah, Canada, and Greenland. Adults were normally about three feet long, but some could have grown up to six feet. Fossils of Anomalocaris canadensis show that it had a skinny head and long eye stalks, so it could have been able to turn its head and swivel its eyes while it was hunting for prey. Some scientists believe that Anomalocaris ate trilobites. This evidence comes from Anomalocaris briggsi coprolites found in Australia, which contain pieces of trilobite exoskeletons, as well as trilobites with bite marks in them, which are found in many places. Some scientists don't believe that Anomalocaris normally ate trilobites because its mouth parts may not have been hard enough to penetrate trilobite exoskeletons. 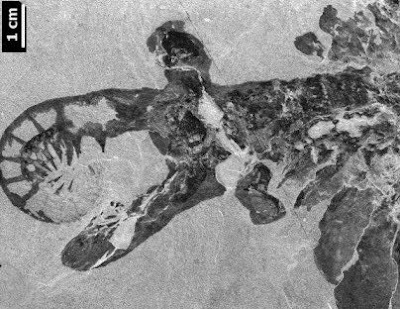 Anomalocaris mouth part fossils do not show any signs of being worn down by trilobite exoskeletons. But to some scientists this just points to the spines on the mouth parts being pliable but hard. So it's possible that Anomalocaris did still normally eat trilobites. Anomalocaris fossils are most commonly found as disarticulated pieces, but well-preserved juveniles and some well-preserved adults are known. Although A. canadensis had its claws curled up under its head. A. saron had its claws stretched out sideways in front of its face so they would have acted like scissors, where the spikes on one claw faced the spikes on the other claw. But there are other differences between the two species. A. saron had legs and cerci, while A. canadensis did not. But they did share the same basic structure. Some scientists believe Anomalocaris pennsylvanica was just a non-Canadian A. canadensis, but they might be different species. Tetrapods are four-legged vertebrates that were first thought to have appeared in the late Devonian Period, and they were thought to be descendants of elpistostegid fishes like Tiktaalik and Panderichthys. 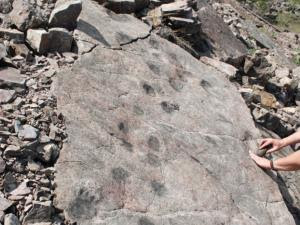 But in 2010, in Poland, scientists found tetrapod tracks from the middle of the Devonian Period, meaning tetrapods appeared earlier than previously thought. elpistostegid, this means that the elpistostegids, like the famous Tiktaalik, were not ancestors of tetrapods. Instead, the direct fish ancestors of tetrapods are not currently known. Some of the trackways that have been found indicate that these early tetrapods grew up to at least two meters long. They probably looked a lot like other Devonian tetrapods, such as Ichthyostega. Scientists used to think that tetrapods had their origins in freshwater environments, such as swamps and lakes. But the tetrapod tracks found in the Zachelmie Quarry were found in what had been a marine environment, like a lagoon. This means that tetrapods may have had their origins in saltwater environments. The trackways indicate that these tetrapods walked in a sprawling gait, like lizards. The trackways also show that the tetrapods that made them were not walking on land. They were actually partially submerged in shallow water. If they were sprawling on land, their stomachs would have left a drag mark. But there are no stomach drag marks in the trackways in the Zachelmie Quarry, which means the tetrapods that made the tracks were floating, and their feet were pushing them along the bottom of the lagoon. Many thanks to Robert for showing me these tetrapod tracks from the Zachelmie Quarry, and for letting me use his really cool illustration of what the tetrapod that left those tracks is believed to have looked like. Graptolithinia is a class of shelled hemichordates that lived from the Cambrian to the Carboniferous. 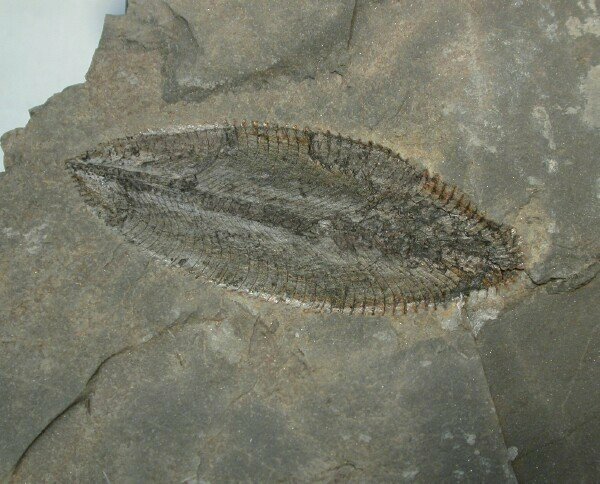 One of the first graptolites was called Chaunograptus, from the Burgess Shale. Chaunograptus made a living by hitching onto other animals like sponges and arthropods. 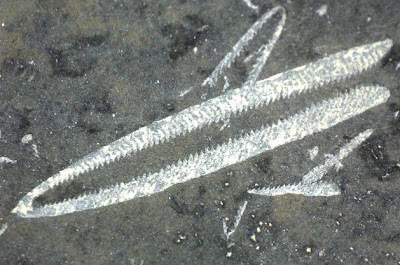 Later graptolites, like Monograptus, had pelagic lifestyles and drifted with the ocean currents in the open sea. But one group of Graptolites, the dendroids, retained a benthic or a parasitic lifestyle. The name graptolite means "writing on the rocks" in Greek, which refers to the fact that most graptolite fossils look like hieroglyphics. In life, some graptolites, like Monograptus, may have resembled hacksaw blades, where others, like Didymograptus, resembled pinking shears. There were hundreds, probably even thousands, of different forms of graptolites. The morphology of graptolites was very diverse. Some graptolites were benthic, some were parasitic, some were pelagic, and there were many forms of graptolites living each of those lifestyles. Graptolites were hemichordates. They were not chordates, but they were very important in chordate evolution leading up to humans. 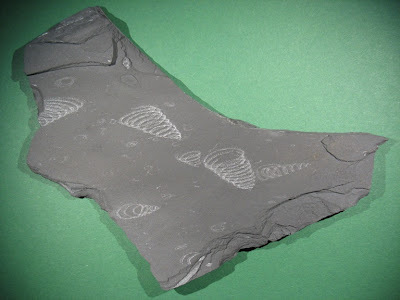 Graptolites are index fossils for the Ordovician and Silurian. Some graptolites are very common, like ammonites, which are also good index fossils. Most good index fossils are common, widely distributed, and from a limited time span. This helps scientists date rocks.